Mackenzie da Luca’s mother is missing. in the jungles of Panama. are in those same jungles. Her dad is desperate to find out what’s happened to his wife. “The story twists and turns as Kenzie attempts to unravel the truth on her own. The ending is impossible to predict. 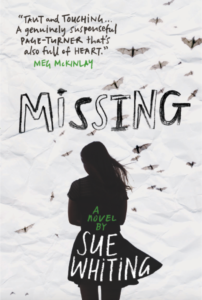 Gritty, engaging and always, exciting, Missing will appeal to mature young readers, aged 10-plus, who like their books heart-full and real.” FIVE STARS – Sandy Fussell, The Sunday Telegraph.